P1238. ERNST LÉVY: Sonata #32 in c, Op.111, Live Performance, 6 April, 1952, M.I.T. ; Sonata #31 in A-flat, Op.110, Live Performance, 16 Jan., 1955, M.I.T. (both Beethoven); Variations and Fugue on a Theme by Handel (Brahms), Live Performance, 20 Feb., 1955, Sanders Theatre, Cambridge, MA. St Laurent Studio YSL 33-358. Transfers by Yves St Laurent. 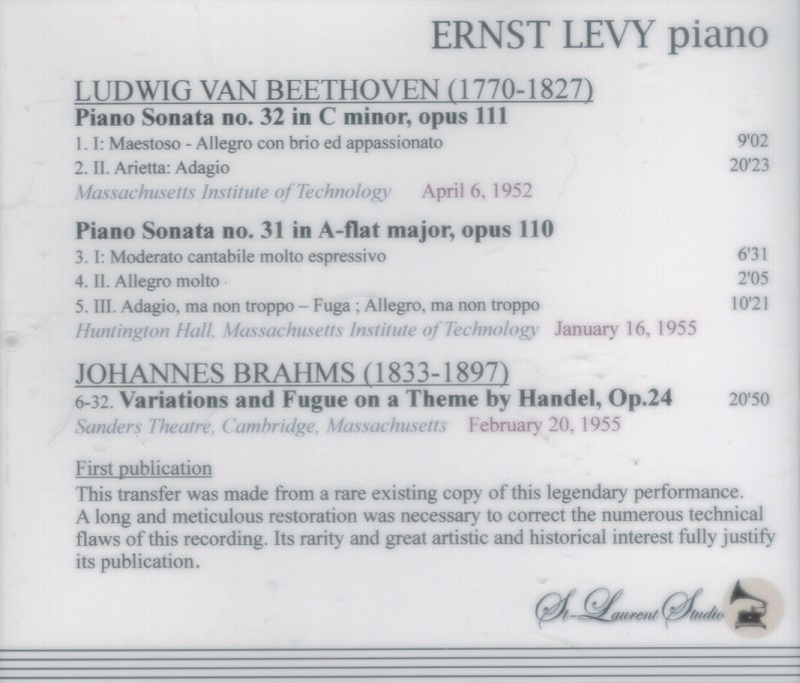 "Lévy was more than a virtuoso pianist - though his technical prowess was staggering; he was an intellectual in the true sense of the word, and music was but one aspect of his creative life….Lévy's Beethoven is the pianistic equivalent of Furtwängler...."
“The distinguished Swiss pianist, pedagogue, and composer, Ernst Lévy, studied in Basel with Hans Huber and Egon Petri, and in Paris with the French virtuoso Raoul Pugno. By 1916, Ernst Lévy was teaching at the Basel Conservatory alongside Huber, and from 1917 to 1921 he was head of the piano master-class at this institute. Four years later, he set up residence in Paris and, after spending some time as a pianist and teacher, he was founder-conductor of the Choeur Philharmonique in Paris (1928). Among the works given their Paris permieres under Levy's direction were Johannes Brahms' EIN DEUTSCHES REQUIEM and Franz Liszt's oratorio CHRISTUS. In 1935, Lévy and Choeur Philharmonique recorded Liszt's MISSA CHORALIS for the Polydor label, the first recording ever made of one of Liszt's sacred choral works. Political conditions in Europe during the 1930s brought Ernst Lévy, a Jew, to the USA in 1941. He taught at the New England Conservatory of Music in Boston from 1941 to 1945, Bennington College in Vermont from 1946 to 1951, the University of Chicago from 1951 to 1954, the Massachusetts Institute of Technology from 1954 to 1959, and Brooklyn College of the City University of New York from 1959 to 1966. Levy's teaching of piano and composition, and his abilities as a choral and orchestral conductor, kept him fully occupied during his American years; this period also saw a remarkable output of works that ultimately embraced 15 symphonies and an impressive quantity of chamber and choral music. 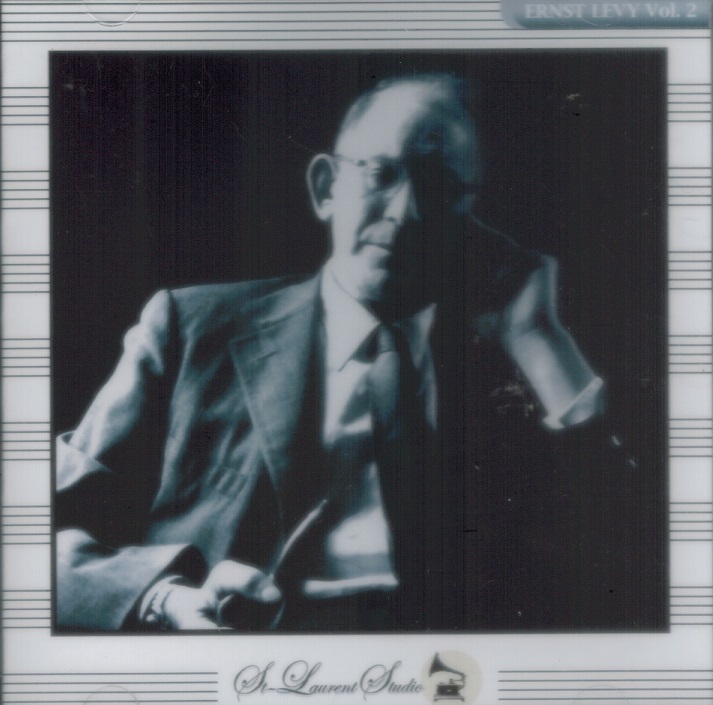 It was during this time that Lévy presented occasional recitals as pianist and made a series of recordings on the USA Unicorn label. He retired from academia in 1966 and spent his remaining fifteen years in Switzerland. 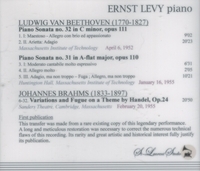 As a composer, Ernst Levy's idiom was not identifiable with any school or tradition. He was a firm believer in the viability of tonality (as opposed to dodecaphony), and he constantly sought new vistas within the parameters of tonal music. He went so far as to study the writings of Pythagoras and the mathematical similarities between musical scales and start distances explored by Keppler. Lévy measured the south tower of the Chartres cathedral to determine the relative proportions of the tower's architectural elements and published his findings on the subject as an appendix to the book, THE GOTHIC CATHEDRAL: ORIGINS OF GOTHIC ARCHITECTURE AND THE MEDIEVAL CONCEPT OF ORDER, by Otto Georg Von Simson in 1956. Lévy concluded that the entire cathedral was a fully calculated, deliberate representation, ‘full of symbols, and full of musicality’.